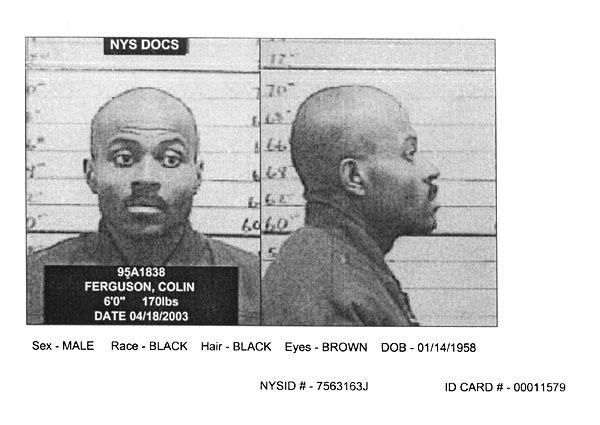 Colin Ferguson, whose December 1993 rampage on the Long Island Rail Road left six dead and 19 wounded, posed for this New York State Department of Correctional Services mug shot in April 2003 after being transferred to the Attica Correctional Facility. Ferguson, sentenced to a minimum of 315 years in prison, will not be eligible for parole until 2309. Submitted by blkhummerman on Wed, 2011-05-11 14:38. 315 years, is that all? Boy the the justice system is a joke. Submitted by lisasmurf82 on Tue, 2011-03-29 15:35.